ALL lashes will be customized to your needs and lifestyle as discussed at Your consultation. LASH EXTENSIONS CREATE A VARIETY OF LOOKS FROM MODEST ENHANCEMENT TO A FULL OUT GLAM LOOK. WE CAN HELP YOU CHOOSE THE LOOK THAT YOU'LL LOVE. Refer a Friend and receive 50% Off of your Next lash Appt! Silk extensions for ladies wanting more of a mascara look. These lashes have a beautiful glossy sheen and present themselves boldly. Up Town Mink lashes are the most soft and comfortable extension on the market. Soft & Luxurious to the Touch, these lashes feel very Natural and offer a perfect alternative to wearing mascara. Fushion lashes are the perfect answer for those who want just the right balance between classic and Volume lashes. Full and Flirty, Fushion is your GoTo Lash! Volume lashes are for anyone wanting a Show Stopping look. Volume extensions use a gentle and very light weight lash to create a look of LUX! They are by no means for the Faint of Heart. Volume lashes are POW! They are unarguably Eye defining gorgeous. 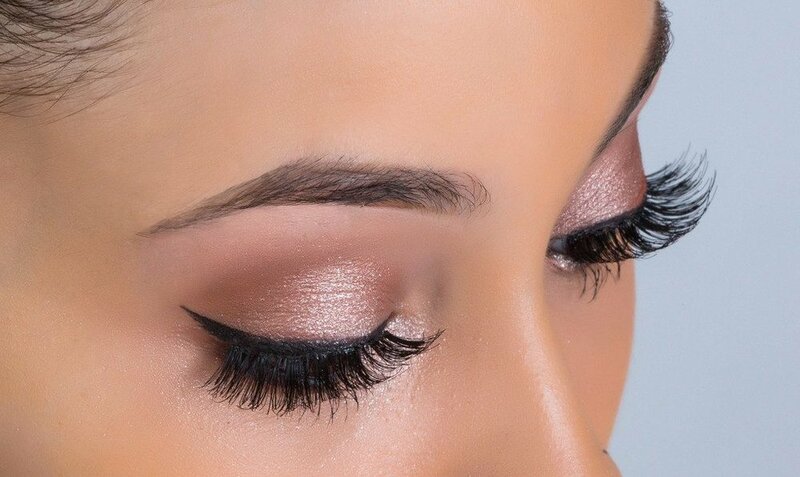 Several Fine and Fanned out lashes are applied to each and every lash so that you have a Dolled up Look Day & Night. Simply Stunning ! Eye Candy is now Offering Mega Volume Lashes!! For the Girl who wants to Look her most Glam. Mega volume is the Ultimate in Eyelash Drama. These lashes are applied using between 8-15 very fine feathery individual lashes to create this Stunning full Kardashian look. Mega Volume gives the Fullest, most dramatic look to your eyes for those who want more than Just a little enhancement. The single strand 100% Siberian Mink Eyelash Extensions are the most luxurious eyelash extensions on the market! They are extremely soft and are striking. These intriguing, high fashion lashes are flirty and elegant, yet soft and subtle. Our natural mink lashes are "Cruelty Free". Due to the natural origins of the mink, the lashes vary slightly in thickness/length. Lash lift is a fabulous way to achieve the ultimate low maintenance beauty look! Lashes stay beautifully curled for 6-8 weeks. No more Lash Curler Needed! Lash lift gives gorgeous curl to your natural lashes, creating the illusion of added length as well. This is a great alternative to eyelash extensions as it is no maintenance after the lift treatment.